Kaiteur News of Guyana designated Mustapha Ali as a “Special Person”. Access original posted article here. It takes a lot out of a person these days to be selflessly involved in community work at various levels. First of all it demands a lot of time in spite of busy schedules and time constraints; commitments to family, work, etc. Then it is voluntary; it brings in no monetary rewards. However, community work, on the flip-side, provides self-satisfaction; allows for one to harness skills and talents and use them for the benefit of their community and country. The life of Mustapha Ali of Tain, Port Mourant, Corentyne, is one rooted in community service. He reflects that his time spent in the National Service and period being a Boy Scout, in addition to his religious upbringing taught him a lot – made him value the importance of giving back to his community. Where do we start in listing his community activities and contributions? The list is long. He revealed piles of certificates and letters and other information that chronicled his involvement in community work – particularly in education, social activity, the security sector and religion – over the past decades. His father was businessman Jaffarally, who with his wife operated a grocery shop. He fondly recalled that his mother, Jumni Ali, was popularly known as ‘Neighbour Susan’. After his school years, Mustapha was employed with Edward B. Beharry as Driver/Salesman in Georgetown from 1973-1974 and a Life Underwriter Insurance Agent with British American in New Amsterdam from 1974-1976. Being born into a business-oriented family at Sparendaam on the East Coast of Demerara, Mustapha today still operates and manages his catering service and Snackette which caters for almost every major event being held along the Corentyne Coast. Having seen that not a lot of persons were into the food and catering business back then, he decided that this was the direction in which he wanted to go. After getting married, Ali moved to Berbice where he started a catering service and restaurant in 1987 in the Port Mourant Market. Two years later he acquired a property in Rose Hall Town, and another business venture at Belvedere on the Corentyne, but had to close this, since his son who operated that business, died. He moved out of the market and established his snackette in 2011 at its current location, Tain, where he also resides. Mustapha has spearheaded many community projects, including the construction of a President’s Youth Choice (PYC) building at Port Mourant and a Benab at the Felix Austin Police College (FAPC) at Adventure. He was elected chairman to PTA bodies of various schools for 16 years, and served as President of the body at Corentyne Comprehensive High. He also served as Councilor of the John’s Port Mourant Neighbourhood Democratic Council for four years. In the field of sports, he served as President of the Port Mourant Cricket Club from 1986-1994. To date, he is serving as Imam and President of the Port Mourant Islamic Mosque, a post which he has held for over 15 years. He has been called upon on numerous occasions to recite prayers at various events on behalf of the Muslim community: opening of UG Berbice campus; Whim Magistrate’s Court; N/A Hospital; Berbice Expo, and performed countless lecturers to schools on religious morality. Donating items to ‘B’ Division via former Commander John Daniels, a few years ago. Ali shares a very close relationship with the police in ‘B’ Division. In addition to this, he has provided a basketball court for the youths in the community; served as Chairman of the Community Policing Group (CPG)and of the Sub-Divison #2 Whim Police Road Safety Association and is currently serving as a member of the Region 6 Road Safety Council. He is also Honorary Chairman of the Whim Sub. Division #2 Station Management Committee and Resource Personnel – First Aid Course at FAPC. He has donated numerous road-safety signs in Sub. Div. 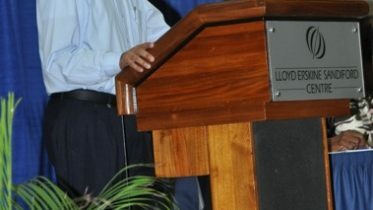 #2; supplied 10 wooden double bunk beds to the Whim Police Barracks; assisted in replacing zinc sheets on the Traffic building at Whim; conducted and assisted with numerous fund-raising events for police in Berbice; lectured to children in various schools during Road Safety Week; assisted ranks with driving classes; helped police annually with children and senior citizens’ parties; and painted countless pedestrian signs along roadways. He uses all of his own road-painting equipment for the job. Ali also coordinated and chaired the school children patrol rally from 1997-2009. By request of the then Commandant of the FAPC, Mr. Amsterdam, Ali started the Scout Club in Berbice. His family also sponsored the construction of the Scout’s Den. Mr. Ali was involved in one of many pedestrian sign-paintings in Corentyne recently. Ali served as Chairman, Member and Vice-Chairman of the Indian Immigration Cultural Committee in Berbice; Chairman of the Board of Directors of the Berbice Islamic School; Member of the Board of Directors of the New Amsterdam Technical Institute (NATI); representative for Region 6 on Amana Hands Inc in New York and Human Concern International of Canada, charitable overseas-based organizations; member of the Region 6 Education Committee, Region 6 Administration Sub Committee on Youth & Sports, and Rights of the Child Committee. He also served as a member of the Region 6 Prisoners’ Visiting Committee and of the Port Mourant Market Administration Committee. For all his contributions to community service, he has received countless letters of thanks and certificates of appreciation, including a certificate from the Special Olympics Guyana Committee for attending the 1999 Special Olympics World Summer Games. When asked how he finds the time to dedicate himself to all this community work, he responded by saying that at one time he was a part of 11 organizations and was asked a similar question. Mr. Ali with his wife, children and grandchildren. He advises that one has to be trained in order to do all this community work. He is also integrally involved today in education, religion and with the police. Ali is also deeply involved in Islamic work, and has coordinated several youth leadership courses for the Guyana Islamic Trust (GIT). 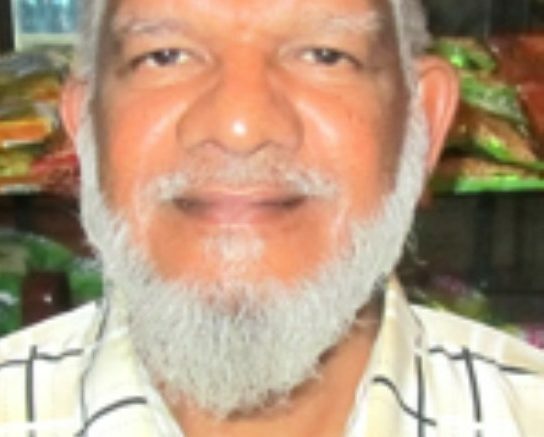 He received an appreciative award from the Central Islamic Organization of Guyana (CIOG) and the GIT; he is also in charge of the Lower Corentyne District, in terms of Islamic-related activities. His advice to young people, “every entity that the Creator has created depends on each other, and we are told that if you serve the Creator through worship, you also must serve him through people and be kind to other creatures, especially the animals…some people only focus on me, myself and I…Islam teaches us that we must make sure that our neighbour goes to bed having his last meal. Be the first to comment on "Mustapha Ali is a “Special Person”"